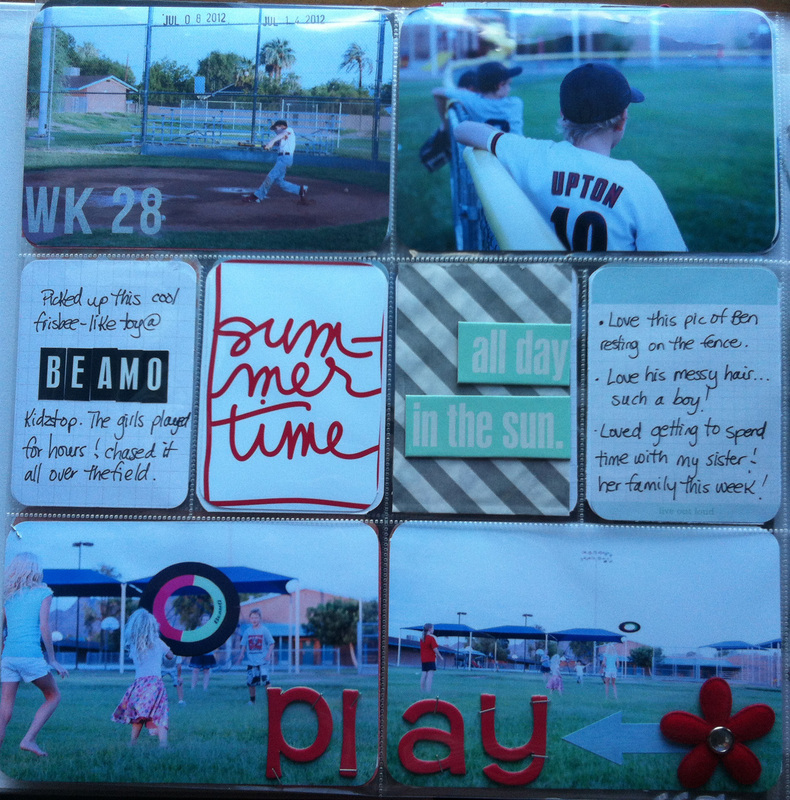 Project Life: Week 28 | I am JuJu! Hi there everybody! Today I’m sharing week 28 of our project life album with you. I am still behind, but I’m hoping to get several more weeks put together this coming week. If you are here from The Mom Creative link-up, welcome! This week I kept things pretty simple. I think this week might be the 1st week that I used mostly 4×6 photos. I threw in 1 polaroid that I had taken. Seriously, this layout was a breeze to put together. 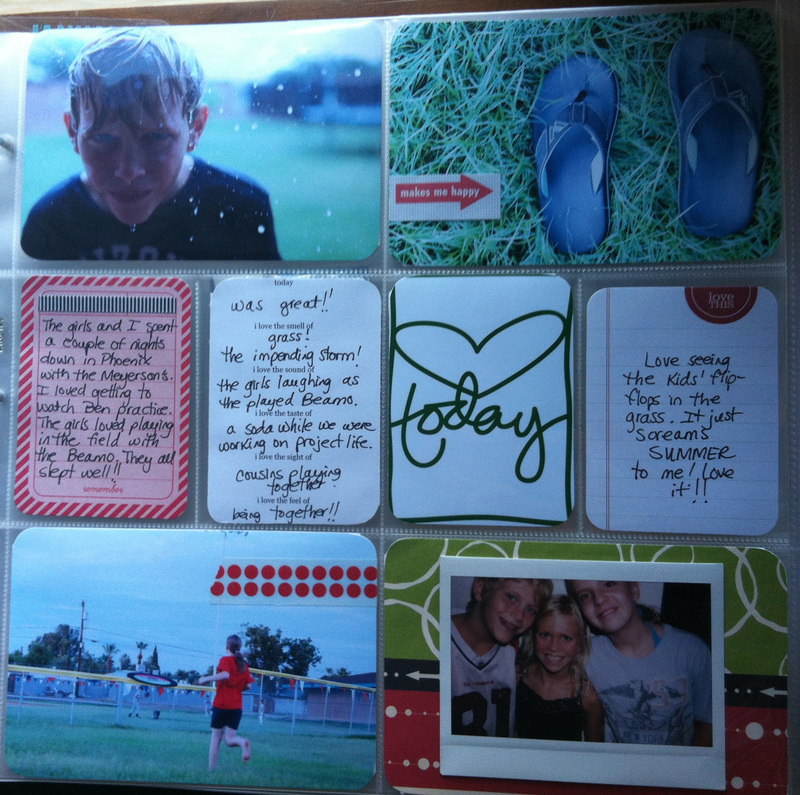 I added a few embellisments to a few photos and journal cards and called it a day! Below is a shot of my entire layout. The “BEAMO” letter stickers, red letters, flower and “all day in the sun” embellishments all came from my stash. I’m really working hard at using what I have. 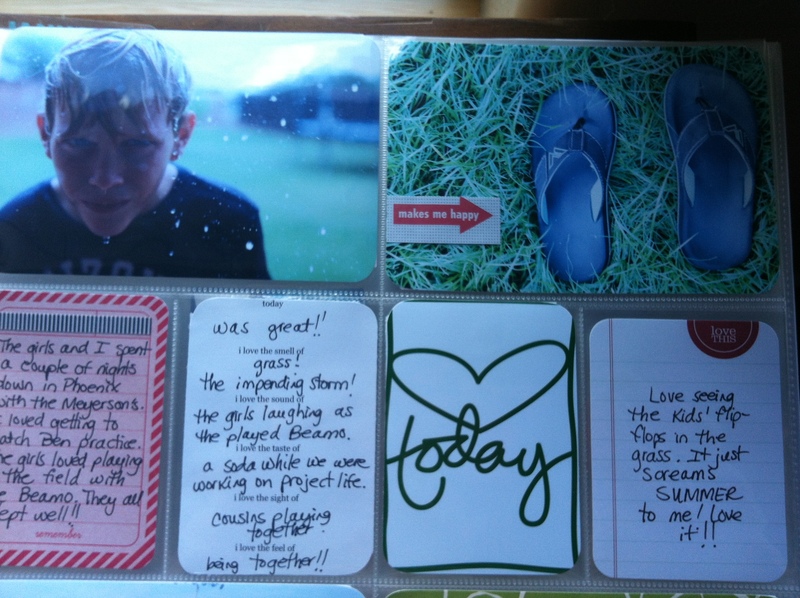 Both the “summertime” and “heart today” journal boxes are from Ali Edwards. I continue to love her digital overlays. Here is a close-up of the title/date picture. I used these digital letters and these digital numbers to put WK 28 directly onto the picture of my nephew Ben. They came from Catherine at Design Editor. LOVE HER STUFF! 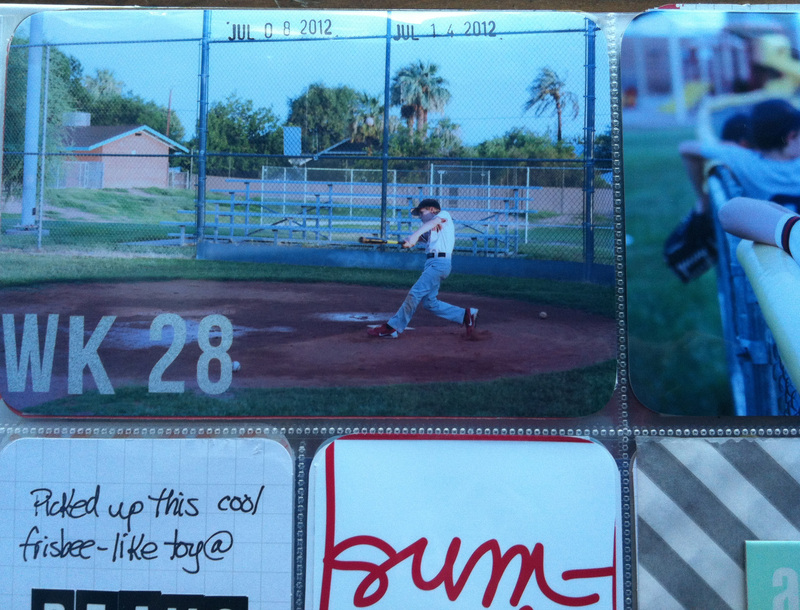 I then used my date stamp and Staz-On to stamp the date directly on the picture. I really wanted to change things up with my title card this week and using the digital letters & numbers helped me do that. Here is a look at the right side. I used on of these journal cards that I’ve used before from Mara Writes. I love how they add just a touch of what I’m experiencing at the moment. I think these will be neat to look back on in years to come. The “makes me happy” sticker that is on the photo of my daughter’s flip-flops is a Smash product. I found that set at my local Wal-Mart. I can already tell it is going to be used again and again. There is just something about seeing my kids’ shoes sitting in the grass that just screams “Summer!” to me! Thanks for stopping by! As always, I welcome any questions or comments you might have. 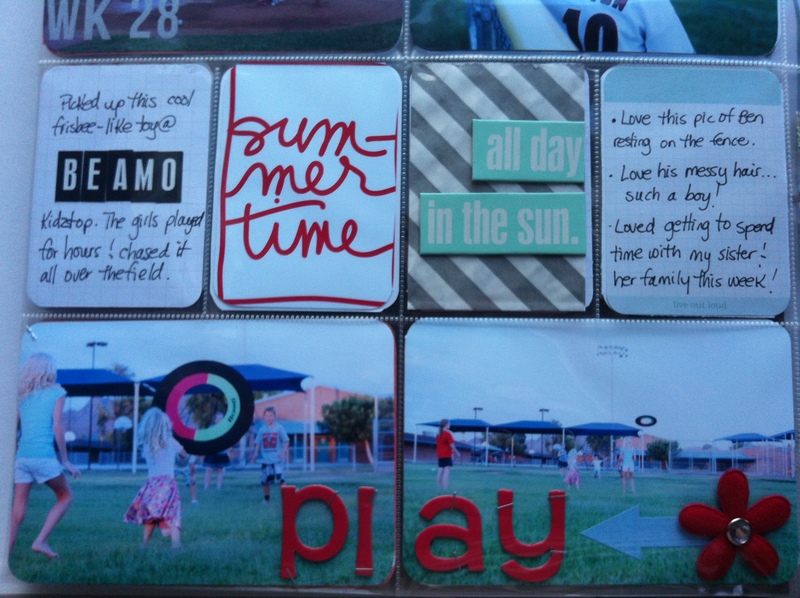 Make sure you head over and see all the other project life layouts at The Mom Creative. This entry was tagged project life, project life week 28. Bookmark the permalink. Hey Julie. Happy to see you back at project life. Love smash! I recently spotted a handful of smash at my local Walmart. They sold out quickly! Great pages as always. TFS. Great pages, love the grey airmail with the red throughout. Love the arrows. It is sweet and simple. Beautiful.